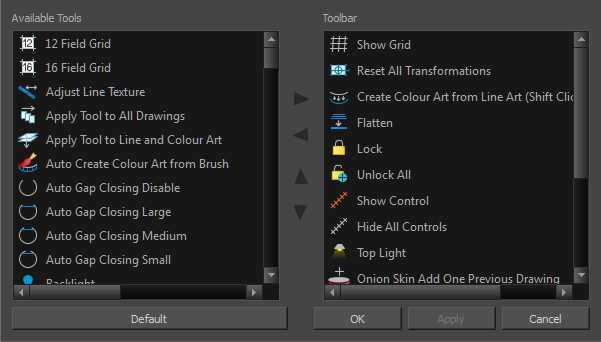 The Toolbar Manager dialog box lets you customize the toolbar in any of the views. You can add your favourite tools to a toolbar for an efficient workflow. For tasks related to this dialog box, see About Toolbars. Right-click on a toolbar in any view and select Customize. Note that the menu will not appear if you right-click on a disabled icon. Displays the complete list of tools available for customizing a toolbar. Displays a list of the tools currently available on the toolbar. Restores the toolbar with its default items.